Fund My Mutual Fund: Time to Panic About Employment (Again)? Time to Panic About Employment (Again)? 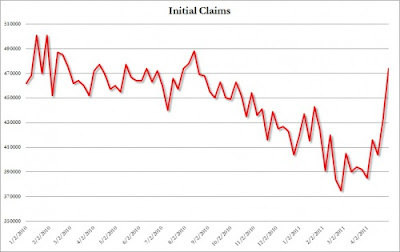 Initial claims had jumped over the 400K level the past few weeks, after 2 months of mostly staying below that level. This morning's 474K figure was from out of left field vs expectations of 410K. Time to panic? Too early to tell - some of this could be due to the tornado situation in the southeast last week. There also appear to be "one time adjustments". A Labor Department analyst attributed the surprising increase to one-time administrative factors, including additional layoffs in New York state due to spring break, which doubled the number of claims in the state. Other reasons cited were a new emergency benefit program in Oregon, and additional automobile industry claims. But it seems clear the economy has taken a turn downward the past 8 weeks - in perfect relation to the spike in gasoline prices over the $3.75ish level. These claims figures won't impact tomorrow's numbers.... but the clouds should be forming over next month's report. Ironically all those economists calling for 3.5-4.0% GDP in Q1 (which instead came in at 1.8%), now have to look deep into their souls at the Kool Aid they have been drinking about Q2 and full year 2011. Especially with the ISM Non Manufacturing figure we saw yesterday. The Bernank's QE programs continue to harm the REAL economy even as it creates new misallocations of capital on Wall Street. Now as always the economy is NOT Wall Street - remember usually when a company chops 40,000 workers, the stock surges! Dan Gross of Yahoo Finance wrote an awesome piece on why it's a great time to be a Fortune 500 company (horrible U.S. labor market, weak private sector labor unions, cheap money, friendly government, lobbyists running the country, and big overseas markets to exploit) - nothing new to long time readers of FMMF but I like to see these type of articles in more mainstream media.